My good friend BARB is on the design team for THE CHEERFUL STAMP PAD, their latest challenge is a Silhouette challenge. I loved Barb's reindeer silhouette card so much, I decided to play along with the challenge. 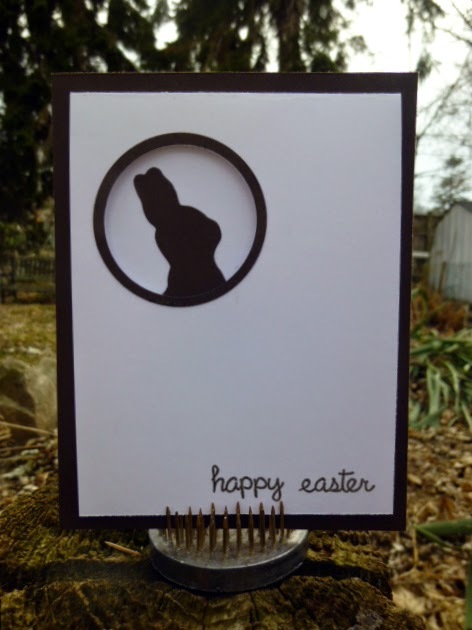 Here's what I made for the challenge...an Easter bunny silhouette card. I love this type of card, the base is a flat piece of 5.5" x 4.25" cardstock (the Early Espresso here) and the card is a folded piece of 10" x 3.75" piece of cardstock (the white cardstock). So it's actually the smaller white cardstock that opens...just a bit of a different fold, super cute, quick and easy to make and flat for mailing YAY!! You can only see the silhouette of the bunny's head through the window in the front of the card, when you open the card...luckily no-one has taken a bite of his bum (YET). Wow love your Silhouette card, Thanks for the shout out too. So happy you joined in the Silhouettes challenge at The Cheerful Stamp Pad. Who eats the bum first? EARS! Get it together ;) This is simply gorgeous!